A UNC geophysicist is sending his research as high as he can—125,000 feet and counting. 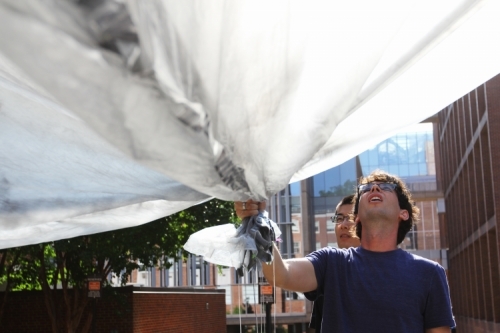 Danny Bowman prepares to launch a homemade solar balloon from UNC’s campus on May 29, 2015. Danny Bowman is not a pessimist, but he has launched enough balloons over the years to know that things do not always go as planned. In high school, he and his friends launched a balloon, constructed from balsa wood, a trash bag, and birthday candles, that flew 30 feet before landing in a tree and starting a fire. He has learned a lot in the 15 years since that first balloon launch—so much that he now participates in NASA balloon launches—but, like any good scientist, he is always skeptical of his own design and engineering. It’s a warm, sunny morning in late May and we are standing in the parking lot behind Mitchell Hall on UNC’s campus. I have my camera and Bowman has what looks like an enormous trash bag spread out on the ground. It’s a solar balloon that he and his colleague Xiao Yang constructed from a plastic paint drop cloth. Bowman picks up one end of it and slowly starts jogging in circles. Ten minutes later, the 19-foot homemade balloon is fully inflated and bobbing slowly up and down. Bowman holds it above his head then spreads his arms wide to release it. The massive balloon slowly floats up, up—and into the corner of the brick building in front of us. For a few agonizing seconds, it looks like it might be stuck. And then, with help from the slightest breeze, the balloon detaches from the building and continues to glide upward. A minute later, it’s hundreds of feet above us—and gaining. I snap as many photos as I can while the balloon is still in sight, and then turn to Bowman. Eyes fixed on the sky, he smiles. I look back to the balloon–now just a white speck in our Carolina blue sky. Over the next two hours, it will soar to 72,000 feet. Building and launching solar balloons is more than just a fun challenge for Bowman—it’s a fundamental part of his PhD research at UNC. As a geophysicist, Bowman specializes in recording infrasound in the stratosphere. In much the same way that his seismologist colleagues track seismic waves to map the inner parts of the earth, Bowman uses infrasound waves to glean information about the earth’s surface and atmosphere. The “bass notes” produced by storms, ocean waves, volcanic eruptions, and earthquakes can travel great distances—and they carry energy. “So if you know how many sound waves are going up, you can calculate how much heat that’s generating in the upper atmosphere,” Bowman says. That heat energy could have consequences for satellites. The United Nations uses low-frequency sound measurements to enforce the Comprehensive Nuclear-Test-Ban treaty. In the future, this technology could help the military record clandestine nuclear blasts. Stratospheric infrasound measurements could also help detect small meteors and asteroids entering Earth’s atmosphere—some of which are too small to be picked up by traditional ground-based means. After a meteor exploded over Chelyabinsk, Russia, in early 2013, researchers became much more interested in methods for detecting smaller space fragments. The Southwest Research Institute in Colorado is in the process of launching an initiative to do just that—using the same approach as Bowman. “They haven’t flown yet, but they’re going to,” he says. Bowman’s technology ultimately allows him to record signals that don’t necessarily make it to the ground, and signals that happen very far away. So far, in fact, that he can record ocean sounds from the desert. In the southeastern corner of New Mexico, just outside the tiny town of Ft. Sumner (population 1,200), is a small municipal airport. The quiet property includes one runway and a few buildings, surrounded by a lot of flat, dry desert. Most of the year, this remote piece of land sees very little activity. But on a clear morning in early September, the place is buzzing with energy—dozens of engineers and scientists are hard at work here. This little airport in the middle of nowhere is also a NASA base for high-altitude balloon launches. Every September, the Columbia Scientific Balloon Facility team and science students from universities across the country, descend upon Ft. Sumner to launch research experiments into the stratosphere. Bowman, along with his friend and colleague Jake Anderson, is among them. Bowman has spent the past six months planning, designing, and building payloads to house his infrasound microphones as they ride along on the High Altitude Student Platform (HASP) flight. Students go through a rigorous application and testing process to have their experiments accepted to fly 25 miles into the sky. During the 10 years that the HASP program has been running, Bowman is the first researcher from UNC. Bowman checks his equipment on the HASP gondola the day before launch. The next day, Bowman and Anderson haul their equipment into the desert. They set up a ground array that will measure some of the same infrasound signals as the equipment on the balloon. Having two data sets will be helpful when Bowman sits down to analyze the data later. The sun is high and blindingly bright, and the earth is dry and hot. A salamander slithers by, and Bowman warns us to keep an eye out for rattlesnakes. But he isn’t phased by the harsh desert conditions—in fact, it reminds him of home. He grew up just three hours from here in Socorro, New Mexico. His dad was also a geologist. “When you live in the desert, you have to make your own fun,” Bowman says. He and his daredevil friends were good at it—they built and launched their first homemade balloon in high school. In the hangar at the Ft. Sumner Municipal Airport, Bowman checks his equipment and chats with HASP director Gregory Guzik. “What are the winds doing up there?” Bowman asks. The stratosphere houses winds that change direction—or “turn around”— twice a year. In the summer, the stratospheric winds blow from east to west. In the fall, typically in September, they switch. Today is Sept. 5, and the winds haven’t switched yet. The launch should happen in two days. If all goes well, the balloon will fly to an altitude of about 120,000 feet, float a couple hundred miles west, and then come down north of Flagstaff, Arizona. Like clockwork, launch operations begin at 3 a.m. with a lot of coffee and not a lot of small talk. Everyone focuses on the job at hand, systematically running through checklists. By 5 a.m., the team rolls the gondola out of the airplane hangar. At 7 a.m., the engineers begin to inflate the 500-foot balloon with helium. The total suspended weight beneath the balloon is about 2,000 pounds that, when fully inflated, can fill an average football stadium. For a successful launch, conditions need to be perfect. Bowman and the other researchers wait and watch nervously, aware that the launch could be called off at any time. By 8 a.m., it’s confirmed— the launch is a go. The balloon takes off and, within 30 minutes, the lithium battery-powered payload floats 25 miles high. Thanks to radio signals from the Columbia Scientific Balloon Facility, the team finds everything running as it should be. Except for the balloon’s predicted flight pattern—instead, it hovers directly above the airport. Apparently, the stratosphere turn-around occurred early. As the winds switch, there are a few days of no wind at all. With no wind, the balloon stays put. This is unexpected good news. If it had flown west to Arizona, the engineers would have brought the balloon down that evening—before it could float over into Los Angeles airspace. Hovering over Ft. Sumner, the balloon can stay up overnight, allowing Bowman’s microphones and data loggers to collect many more hours of data. Infrasound microphones are highly sensitive, fragile—and very expensive— pieces of equipment. Fortunately for Bowman, a physical acoustics lab in Boise, Idaho, produces infrasound microphones that are much cheaper and a good bit more durable than typical commercial models. And that lab happens to have a strong connection to UNC. The graduate student was Jeffrey Johnson—a man who doesn’t quit just because something is hard. He returned to the drawing board to build an infrasound microphone durable enough to survive harsh volcanic environments. Today, his lab at Boise State University produces microphones that not only work—they work very well, even in volatile places. Through regular collaborations, Lees and Johnson have created a strong legacy of UNC and Boise State geoscientists—the science family–who always push the limits, whether the task at hand involves installing equipment at the summit of a volcano or launching a payload 25 miles into the sky. Lees loves it when students come to him with a crazy idea. And Bowman has certainly done that while at UNC. 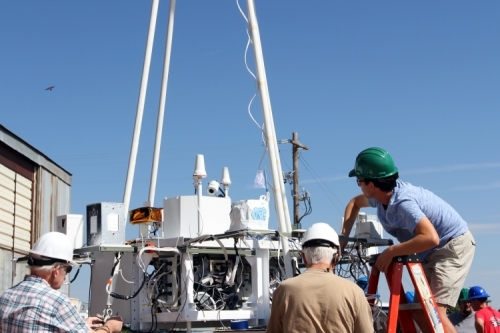 After two successful HASP launches, Bowman has about 30 hours of stratosphere data. Analyzing infrasound signals is a bit like cracking a top-secret code, and Bowman is committed to decoding for many years to come. He needs more data, though, and to gather it, he needs to do more launches. On a bitter cold morning the day before Thanksgiving, he launched a weather balloon that flew to 93,000 feet. Bowman accurately predicted the flight trajectory and landing location, and all the instrumentation remained intact. The flight was not only successful—it was the first of its kind. “As far as I know, no one has ever put an infrasound sensor on a weather balloon before,” Bowman says. What happens next? Upload the data and plan for the next launch. When he’s not constructing balloons or pouring over his data, Bowman searches the Internet for people doing similar things. There are lots of amateur balloon builders out there, posting successful launches (and failures) on message boards, blogs, and YouTube. Like any passionate community of people, they encourage each other to keep sending objects into the sky, despite many failed attempts. But for all the avid balloon builders out there, Bowman stands alone in the realm of modern high-altitude infrasound work. Bowman speculates that lack of funding and a large disconnect between scientific ballooning and infrasound is to blame for the 50-year lapse in research. His research fills a large gap. And his data is entirely different from the measurements taken several decades ago. Technology has progressed exponentially in the past half-century, and the soundscape is completely different now, according to Bowman. Bowman hopes that 10 or 20 years from now, he’ll be able to look at his spectrogram and identify every single waveform—he will crack the code completely. Danny Bowman is a doctoral candidate in the Department of Geological Sciences. His research is funded by the National Science Foundation. Jonathan Lees is the Chair of the Department of Geological Sciences at UNC-Chapel Hill. Jake Anderson ‘09 is a doctoral candidate in the Department of Geosciences at Boise State University. Jeffrey Johnson is an associate professor in the Department of Geosciences at Boise State University. The High Altitude Student Platform program is made possible by the Louisiana Space Consortium at Louisiana State University and the Columbia Scientific Balloon Facility team, a branch of NASA.